Just wanting to ask for some opinions if I may. I have a tour in the Highlands planned for next month and am hoping to go as lightweight as I dare. I already own the Carradice Super C handlebar bag (5l) with the Klickfix attachment. and mount it to something sturdy that I can either thread straps to or around (the thinking is i'd attach It to something sturdy so I could carry a dry bag in front - the Klickfix would give sufficient clearance as to not interrupt hand positions on the bars and with it being sturdy eliminating sway). Firstly, has anyone tried anything similar? (If so what were Successes / limitations). 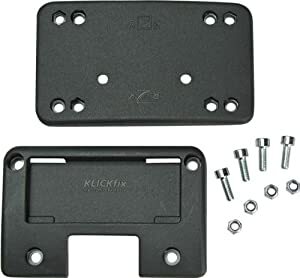 If not, what would you recommend lightweight and sturdy enough to mount the Klickfix to? 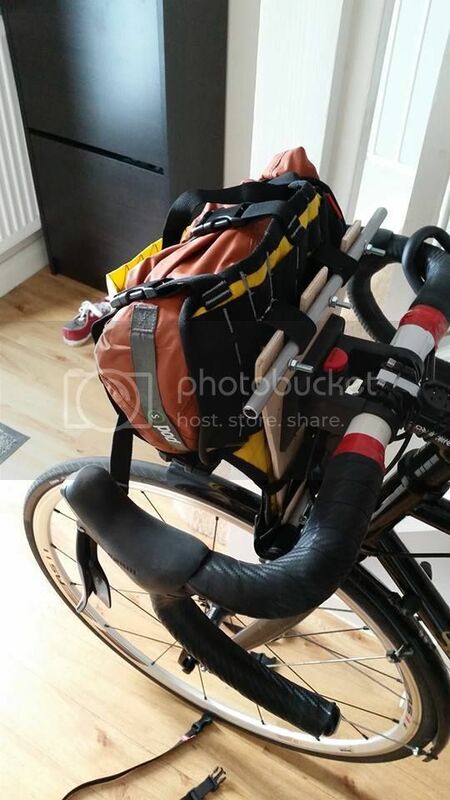 I'll no doubt end up taking the bar bag as it stands but if there's a way to do this then super! I Klikfixified a cheapo barbag and a Topeak TourGuide a while back, but haven't actually ridden with either of them yet. I should do something about that! Attaching the back plate was easy enough in both cases. The TourGuide bag is pretty sturdy/weighty, the cheapo one less so - it's given its shape by a U of fairly flexible plastic, maybe 2mm thick. I don't see why your idea shouldn't work, contingent on being able to find the right backing material and being able to attach the dry bag. I think that would depend - amongst other things, no doubt - on how much weight you'd be needing it to carry, how far it would extend out from the backing and if the contents would be able to lend any rigidity to the structure. It's not entirely dissimilar to the Bridge Street saddle bag, either. Before getting too complicated, try strapping a drybag directly to your bars. 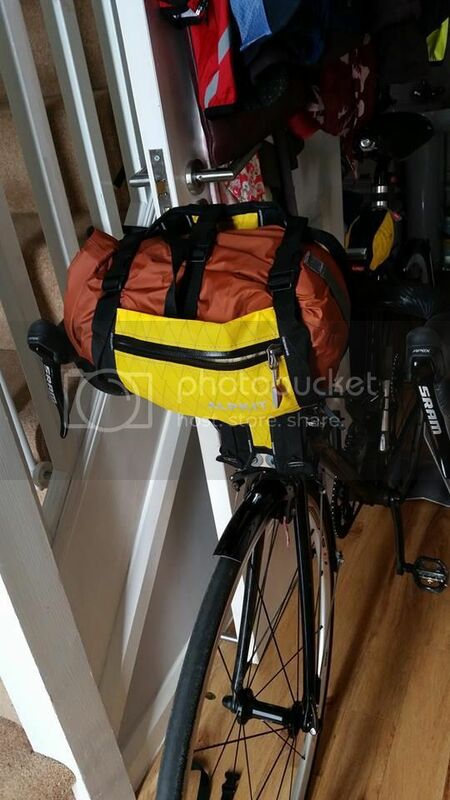 A 5 or maybe 8L Alpkit Airlok Xtra and two 2' webbing straps will work and add some useful capacity. Does interfere with holding the tops a bit, but not too bad. I have an alpkit bag with straps around it that will do the job you want without all the faffing. Not used it yet on a trip but it seems to work ok on a short test ride. 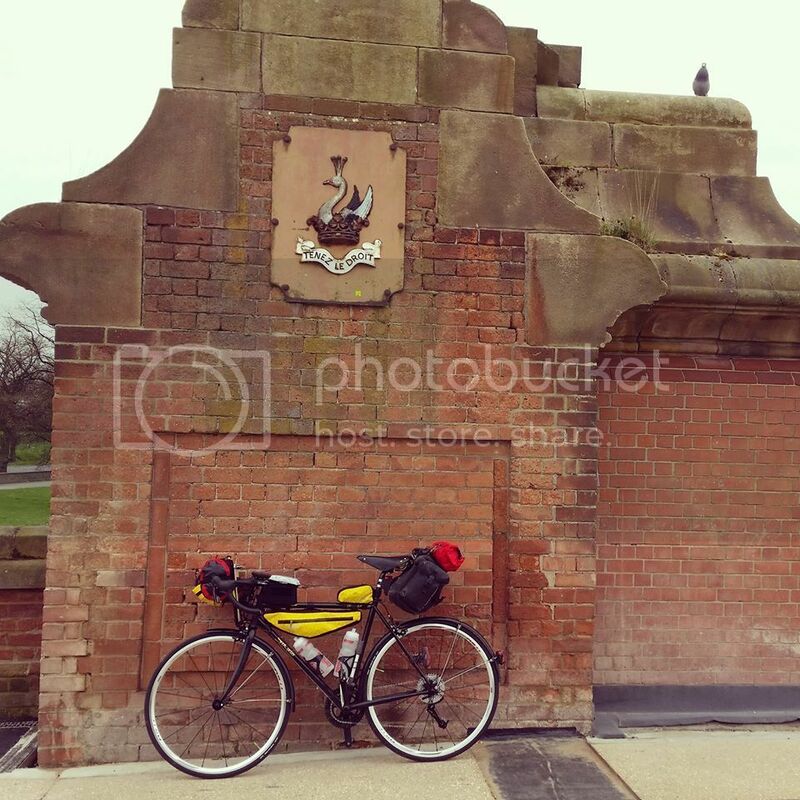 Personally I'd go for a front rack and panniers because the weight is kept very low. You don't have to fill them, obvs. What about a length of square section guttering? Attach Klickfix adaptor and then bungee/strap drybag to it? Look around B&Q, there maybe all kinds of suitable stuff to Molish. 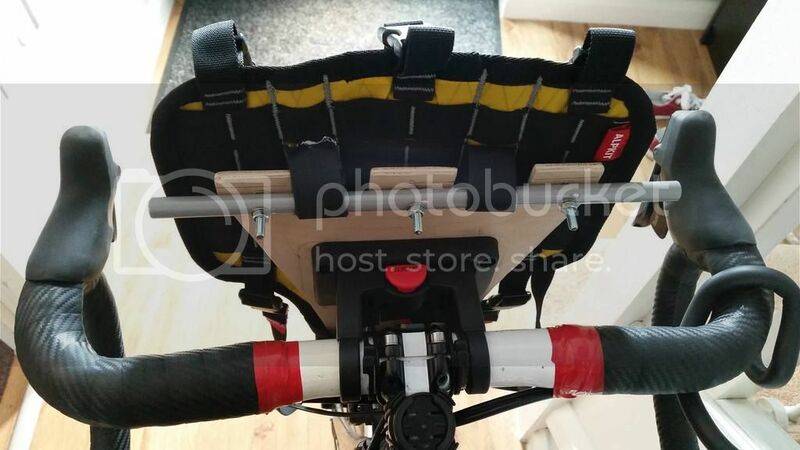 Someone on the Facebook 'Bikes & Bivi' site has started making handlbar harnesses and other products. They use a closed cell foam pad in cordura on theirs, but if you are having a more solid fixing support like the Klick-fix, then it makes sense to have a more rigid back. 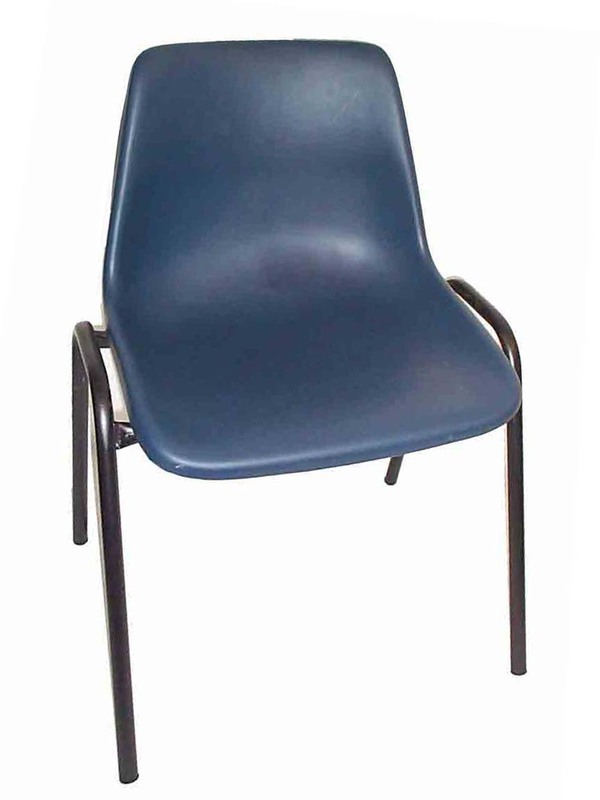 If I was making one, I'd keep an eye on the skip at work (a school) for a plastic chair. They are strong, can be cut with a jig-saw and look to be the perfect shape. If you want to make it lighter, it can have holes drilled in with a holesaw - which would also allow caught rain to drain out. Thanks for all your advice regarding this. Just put into action (ie ordered the parts) for what I intend to do. Using a small, thin piece of ply, I will mount the Klickfix backing plate to this. To the ply I intend to mount a piece of dowel across it to which I will mount a Alpkit Kanga harness. As the harness needs to be mounted to the bikes forks (and as the bike it's intended for has tight fork clearance, this is not really going to be an option) so towards the bottom of the sheet of ply a smaller piece of dowel will be fixed allowing the harness to be fixed at this point (above the wheel & mudguard are and in front of the brakes). As the Klickfix system puts anything mounted to it in front of the bars I will get a full range of hand placements using this approach and as it'll almost act as a quick release bracket (ie the harness will only be mounted to this and not directly to the bike) removing it should be a snip! so here it is, finished product below. Works really well & completed first test ride (47m) and it was spot on. So simple to remove from the bike & doesn't interfere with hand placement at all. Allows me to use the harness on a bike where otherwise it'd be unsuitable (due to the need to mount the bottom straps under the fork. Overall am very pleased, draw back is there is no ideal place to mount a front light but have plenty that will mount on the straps of the dry bag. Back view (will be painted so is weatherproof & looks pretty). and finally, my bike in testing mode (full camping set up for the upcoming tour of the highlands I have planned). 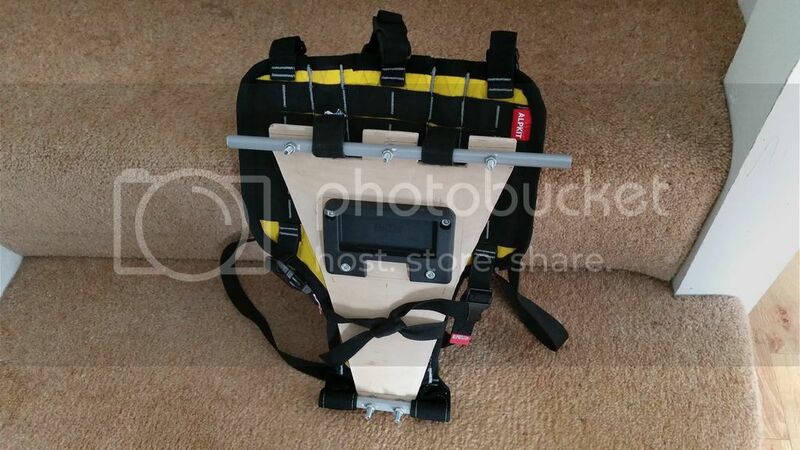 The harness looks solid and ingenious, the whole set up is sleek. I had a giggle, as I landed with only this photo visible and thought "Feck, he's going to strap a baby in it and hang it off his bars". Ha, i'll have to try that Aunt Maud! The little one is 2.5 now so maybe a little big though! so here it is, finished product below. Where have the photos gone?! The photos are still there. Problem with your browser? They don't show on the wap2 version of the site, but that's normal as no pictures do.